Early twentieth century theories of telencephalic evolution maintained that the parts of the telencephalon appeared in serial order in vertebrate phylogeny – the globus pallidus in fish, the striatum in amphibians, and the cerebral cortex in reptiles. The notion of serial appearance of the parts of the basal ganglia is reflected in the frequent use of the terms paleostriatum and neostriatum as synonyms for globus pallidus and caudate–putamen, respectively. Moreover, in older theories of basal ganglia evolution, the cerebral cortex was thought to supplant the basal ganglia in motor control in the mammalian lineage, resulting in the replacement of a supposed reptilian stereotyped motor repertoire with the adaptable mammalian motor capacity. Modern evidence, in fact, shows that both striatum and pallidum have been the basal ganglia constituents since the earliest jawed fish. Moreover, the striatal part of the basal ganglia appears to have been organized into separate direct and indirect striatal output pathways by this time as well. 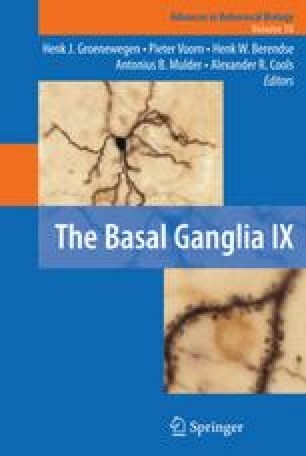 Modern findings also show that during most of its evolutionary history (i.e., prior to mammals), the basal ganglia mediated its role in motor control via output pathways to motor layers of the midbrain roof, via midbrain targets of the striatum such as the substantia nigra pars reticulata. Output pathways to the pallium emerged in the amniote lineage, but remained of lesser significance in living members of the sauropsid lineage (birds and reptiles) than the circuitry to the tectum. With the appearance of neocortex in mammals, however, basal ganglia outputs to motor cortex via thalamus became of greater significance, especially in primates, in which a parallel expansion of cerebral cortex and basal ganglia occurred. I thank my various collaborators over the years who have made the parts of our research presented here possible. I also particularly thank Drs. Harvey Karten, Glenn Northcutt, Steve Brauth, Loreta Medina, and Ann Butler for their many stimulating conversations and ideas about basal ganglia evolution. Any of our work summarized here was supported by NS-19620 (A.R. ), NS-28721 (A.R. ), EY-05298 (A.R. ), the Neuroscience Center for Excellence of the University of Tennessee, Memphis (L.M. ), and the Spanish Ministry of Education and Science (L.M. ), to whom we are grateful.